Thanks to the rapid progression of our technological age it seems that with every new Wi-Fi hotspot comes a new VPN service provider. While having options is certainly not a bad thing, it might be hard for the average user to find a VPN provider that is best suited for their needs. That’s where this review comes in. We’ve sorted through many VPN providers to bring you an overview of a super easy to use, affordable and secure service – VyprVPN. The creators of VyprVPN, Golden Frog, claim their service to be ‘the world’s fastest’ and in our experience this claim holds true. Both download and upload speeds are comparable to local benchmarks. Besides offering impressive speeds, VyprVPN comes with some serious security. Unlike many other providers, VyprVPN handles all of your data in-house. This means that every component is built and put together by Golden Frog without any outside help. They write 100% of their own code, own and operate all of their VPN server infrastructure, and have talented in-house network engineers to optimize their network for speed. By keeping 3rd parties away from their infrastructure, VyprVPN is able to protect your privacy end-to-end. Not many (if any at all) other VPN providers can claim the same. Although Golden Frog doesn’t outsource any of their infrastructure, they have still managed to host quite an impressive number of servers. With over 50 global server locations, VyprVPN offers over 700 servers, with more than 200,000 IPs. 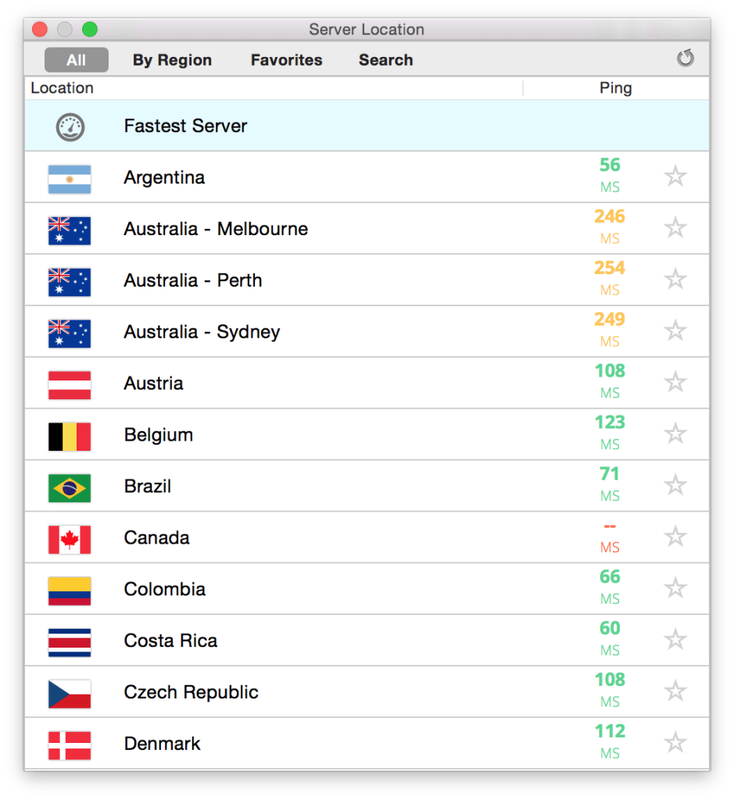 Unlike the competition, VyprVPN also allows users a full and unrestricted Internet experience. The technology behind Vypr defeats VPN throttling by scrambling metadata to make it unrecognizable via deep packet inspection. VyprVPN is also available on any platform – both desktop and mobile. From Mac and Windows to iOS and Android – a well designed and easy to use VyprVPN application is available. This review, however, focuses on the Mac OS app. Let’s take a look. When launching the VyprVPN application, the first thing you’ll likely notice is the beautiful and easy to use interface. 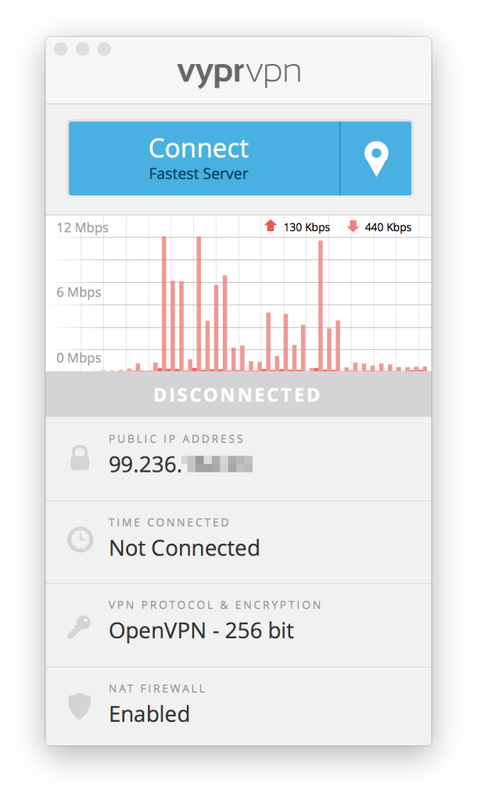 From here you will have the option of quickly connecting to the fastest VPN server. This one-click solution will have you ready to browse the net securely in just seconds. For more advanced users, an option of selecting a specific location is also available. After selecting your preferred location you will notice that the speed graph is now charting data in blue instead of red, this means that you’re connected. You will also notice that your IP address has changed to match your new location – you’re now ready to browse the web securely. VyprVPN makes it incredibly easy for users to connect to and switch between servers. For more advanced users, there are several configurable settings under the hood. For example, you can set up Vypr to automatically connect to a VPN when using a new or untrusted Wi-Fi network – great for coffee shops or travelling. Protocol settings are also adjustable, however, for less expert users it’s recommended that these are left set to their default values. Under protocol settings, you will find 4 pre-configured encryption options, 2 of which can be adjusted further. Here you have the option of choosing the level of encryption that you need – 128-bit, 160-bit, and 256-bit options are available. 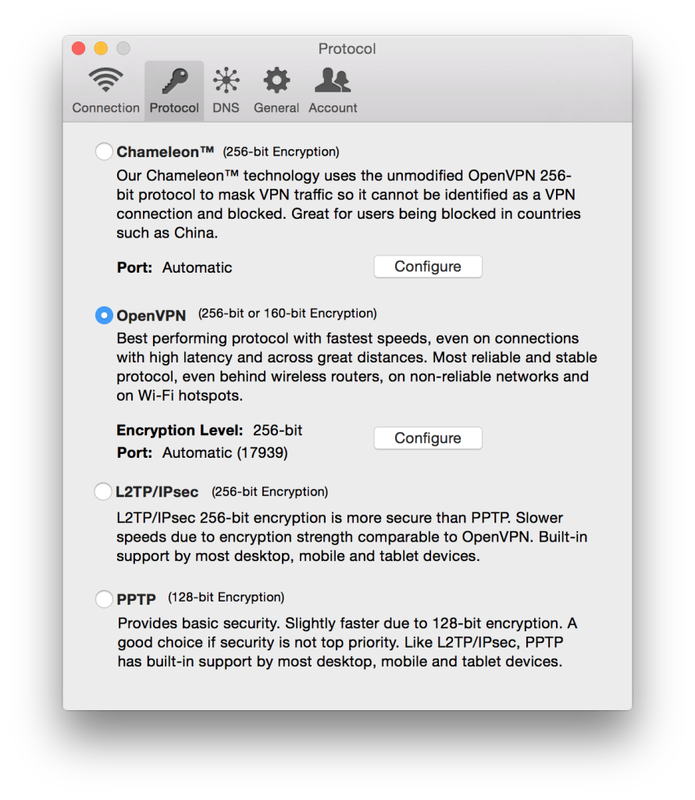 By default, OpenVPN is enabled, and it provides 256-bit encryption and most stable performance. Some users, however, may need to use the Chameleon preset to access every corner of the internet. 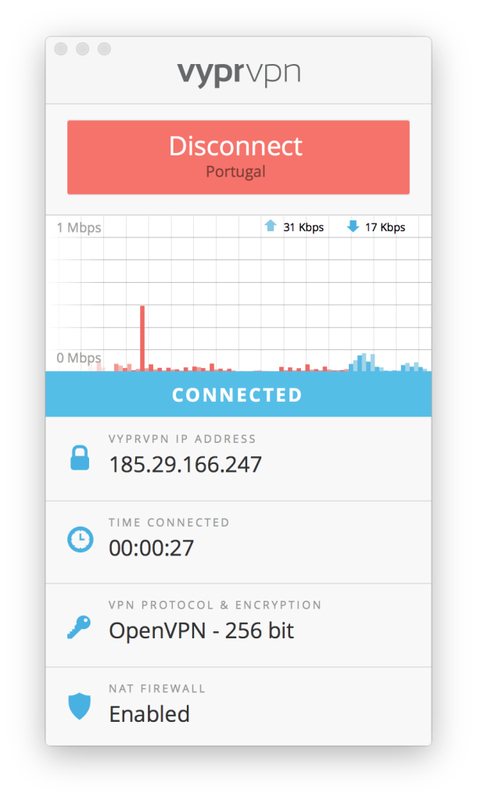 This option uses a modified OpenVPN 256-bit protocol to make sure that your connection cannot be identified as a VPN. This is a great choice for users in countries such as China or Iran who often find VPN services blocked. Finally, if speed takes priority over security, then it’s recommended that you select the PPTP preset. While PPTP provides only basic security, it is slightly faster than the rest of the presets due to its 128-bit encryption. Besides offering an amazing user experience, VyprVPN is very affordable. There are three tiers available – basic, pro and premier. Regardless of the option you select, you won’t be breaking the bank by signing up for this service. Month to month billing starts at $9.99/mo for the basic and caps at $19.99 for premier. You can, however, save some serious coin if you opt for yearly billing, which would significantly cut costs to $6.67/mo and $10.00/mo for basic and premier respectively. 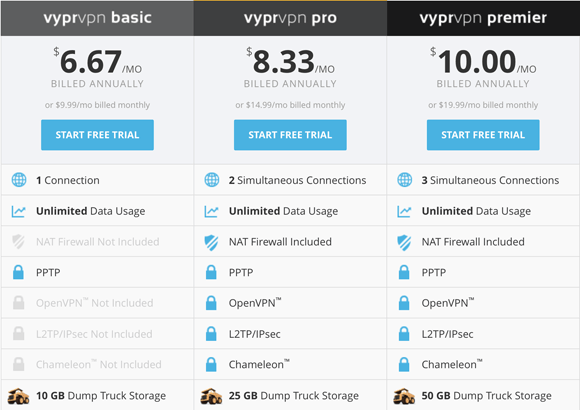 If you’re not yet convinced that VyprVPN is a service that is tough to beat you can try it at no costs. That’s right, Golden Frog is so confident that their VPN experience will blow you out of the water that they offer anyone a free, no-obligation, 3-day free trial. Give it a shot, and decide for yourself whether or not VyprVPN is a VPN solution for you.